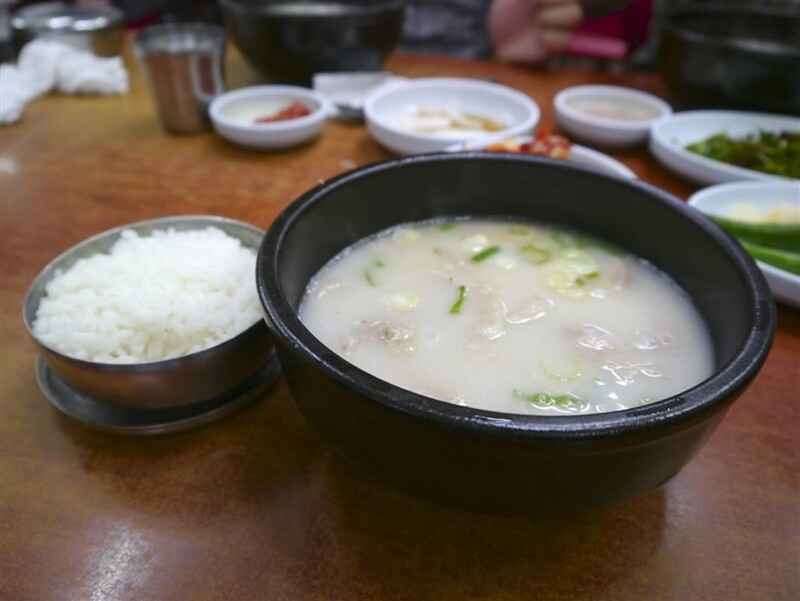 A Busan specialty dish, Dwaeji Gukbap is a pork-based soup and rice dish which is perfect for cold or rainy days. It is relatively unknown and rare in Seoul but many harbor hope that it might soon become a mainstream meal in Korea. Theories abound about the origin of the soup. Some say it was invented during the Korean War when peasants would gather pork bones discarded by the US army and make a meal out of it. Others argue that the soup dates back to the Goryeo dynasty when peasants gifted with pork or dog meat by the nobles were reluctant to waste any part of it.Dwaeji Gukbap is a high maintenance recipe as it takes hours of boiling the pork bone to get the milk-coloured broth. The bones are removed and the other parts of the pork are added to the broth as well as Miso, rice wine, sesame oil and soy sauce. The broth is poured on steaming rice and is served with a variety of side dishes. Most restaurants leave the customers to season the meal themselves. It is encouraged for women after childbirth and for the weak. Create a unique recipe by altering boiling time and adding your own secret seasonings. Some even prefer to add some soju. Not a fan of brine shrimp, and this dish otherwise lacks almost entirely in salt, so it's not my favorite. I do like the idea of adding lots of things for flavor, just wish it came with something else for salt.